©2018 BeaconFieldAirport.com, all rights reserved. No part, portion, or whole of this website may be copied, reproduced in any form without the express written permission of the website owner. Beacon Field Airport® is honoring the 100th Anniversary of US Airmail 1918-2018 with the launch of a new series of short articles on the pilots, planes, routes, stamps, airports, and beacons that made Airmail possible. We have published three of the eight intended articles. The first 2 articles in the series are below. The 3rd is on the front page. Clear skies! Beacon Towers LIGHT the Airmail Route ! Historic Beacon Field, 4 April 2018 --- The first official U. S. air mail flight was May 15, 1918, a daytime flight between Washington, DC and Philadelphia, PA. The need for flying the mail at night has its roots a few years later at the time when the Post Office(PO) was losing significant revenue to the Railway Mail Service for the delivery of business mail that included stocks, bonds, and documents of business. The fast night trains delivered these items overnight from New York City to business centers in Chicago, Detroit, and Cleveland. Business mail by train would be delivered in the next morning in Chicago; the best the Post Office could do by daytime air mail was a full day later. To be competitive, the PO turned to night flying as a means to deliver the mail faster than the night trains. The around-the-clock flying time from New York to San Francisco was almost 35 hours with 13 stops along the 2,629 mile route. Air Mail became the service of choice for time critical business mail to the west. PO revenue skyrocketed! Flying the night mail was wrought with danger from bad weather, pilot fatigue, unreliable engines, and a lack of lights on the ground or in the airplane. There were no radios, no parachutes, and pilots relied on farmers along the route to light bonfires at the time the plane was expected to fly over. Farmers with telephones would call in to say they heard the mail plane. Thirty-five of the pilots hired by the PO between 1918 and 1926 were killed attempting to deliver the mail. A surviving mail pilot recalled the group as a “Suicide Club”. To increase pilot safety and to reduce the loss of the mail due to crashes, the PO decided to light the airmail routes with rotating beacons. They contracted for the installation of Airway Beacons along the entire NY to San Francisco route. By the end of 1924 that route had been lit from Cleveland to Rock Springs, WY., and the PO had acquired 18 airfields, 89 emergency fields, and had installed over 500 airway beacons throughout the US. When completed the beacon tower program installed 1550 airway beacons throughout the United States. Airway Beacon number 55 was installed in 1929 at the highest point in Fairfax County, VA., on a hill overlooking the city of Alexandria. Also installed was its companion electrical generator that provided power to the 1000 watt rotating white light beam and its green course lights. In 1932 the airfield would take the “Beacon Field Airport” name when it was granted a Virginia airport license. 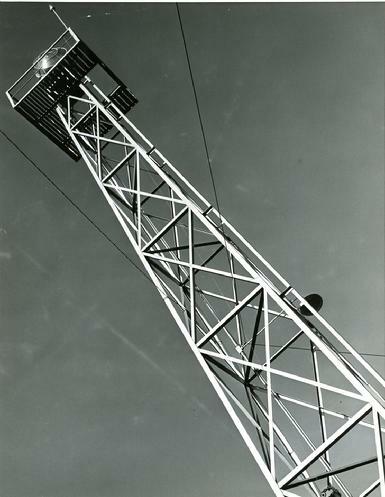 By 1929 the PO had “standardized” the design and construction of their Airway beacon towers using a skeleton steel frame that rose over 50 feet high with a platform at its top for mounting the rotating beacon light. The tower, anchored to a concrete pad, had a build-in ladder to accommodate servicing the lights. East coast mail routes such as the New York to Atlanta route (AM 19) had their beacons installed after the western routes as the eastern routes were heavily populated and were not as dangerous. Beacon Field was on this AM 19 route and its beacon was the first thing a mail pilot would see as he took off from Washington on the way to Atlanta. As radio design advanced and became more reliable the days of the airway beacon towers were numbered. Radios for pilot communication and the radio direction finder (compass) developed by the government under the direction of the Commerce Department greatly improved air safety. In 1936, the results of a U.S. Senate committee investigation on aircraft safety accelerated the introduction and use of the superior radio technologies for mail planes and air liners*. The faithful airway beacons were removed as radio use became the norm along the mail routes and airways. 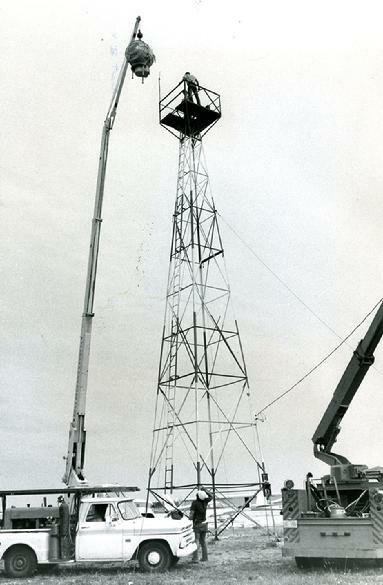 The Beacon Field tower was taken down shortly after the airport closed in 1959. Today, three of the last iconic airway beacon towers are still in operation in Montana’s rugged western mountains where 21st century technology has failed to provide all-weather flight safety. *Courtesy Beacon readers Harold and Deborah Nelson contribution from The Bangor Daily News, May 30, 1936. Historic Beacon Field, February 22, 2018 -- George Washington, surveyor, military general, farmer, whiskey distiller, and America’s First President, was born on February 22, 1732, at his great-grandfather John Washington’s home in Westmoreland County, Virginia, which is south of today’s Colonial Beach. This 660 acre tobacco plantation was located near the confluence of Pope’s Creek and the Potomac River. George lived there until the age of three and he returned to live there as a teenager. He was the eldest of six children and he spent much of his early years at Ferry Farm plantation near Fredericksburg, VA. The U.S. Post Office celebrated Washington’s 200th birthday with the issuance of 12 postage stamps each taken from a famous art work by renowned artists. These stamps are known as the “Washington Bicentennial Issue” (WBI) and are displayed on the legal-size envelope above in their order of postage starting with ½¢ up to the 10¢ stamp. It is interesting to note the changing face of Washington as he aged thru the years of the first portrait (1772 1-1/2¢) to the last portraits in 1795(5¢ and the 10¢). All designs except the 1¢ (a French sculpture) are taken from portraits by American artists. The above envelope has a hand-stamped cache depicting the Washington birthplace at what has come to be known as “Wakefield Corner”. Its postmark is: “MOUNT VERNON FEB 22 8AM 1932”. Washington appears on more U.S. postal stamps than any other person or subject. THE first U.S. stamps produced were the 5¢ Ben Franklin and the 10¢ Washington both in 1847. The WBI alone accounts for 7,172,578,900 (yes, 7.2 billion) stamps issued in 1932 with the 2¢ stamp by far the most at 4,222,198,300 issued. On July 6th, 1932, the USPO raised the letter rate from 2¢ to 3¢; wonder what the USPO did with all those 2¢ stamps? Copyright 2018 ©2018 BeaconFieldAirport.com, all rights reserved. No part, portion, or whole of this website may be copied, reproduced in any form without the express written permission of the website owner.